This article is about the island. For other uses, see Saaremaa (disambiguation). Saaremaa (Estonian pronunciation: [ˈsɑːremɑː]; German and Swedish: Ösel; ) is the largest island in Estonia, measuring 2,673 km2 (1,032 sq mi). The main island of Saare County, it is located in the Baltic Sea, south of Hiiumaa island and west of Muhu island, and belongs to the West Estonian Archipelago. The capital of the island is Kuressaare, which in January 2018 had 13,276 inhabitants. The whole island had a recorded population in January 2017 of 31,357. The island is called Saaremaa in Estonian, and in Finnish Saarenmaa—literally "isle land" or "island land". In old Scandinavian sagas, Saaremaa is called Eysysla and in the Icelandic Sagas Eysýsla, which means exactly the same as the name of the island in Estonian: "the district (land) of island". This is the origin of the island's name in Danish Øsel, German and Swedish, Ösel, Gutnish Oysl, and in Latin, Osilia. The name Eysysla appears sometimes together with Adalsysla, "the big land", perhaps 'Suuremaa' or 'Suur Maa' in Estonian, which refers to mainland Estonia. In Latvian, the island is called Sāmsala, which means "the island of Saami". Saaremaa is believed by some scholars to have been the historic Ultima Thule. According to archaeological finds, the territory of Saaremaa has been inhabited from at least 5000 BCE. Pre-Viking age Salme ship burials have been found in Sõrve Peninsula. Sagas talk about numerous skirmishes between islanders and Vikings. Saaremaa was the wealthiest county of ancient Estonia and the home of notorious Estonian pirates, sometimes called the Eastern Vikings. The Chronicle of Henry of Livonia describes a fleet of sixteen ships and five hundred Osilians ravaging the area that is now southern Sweden, then belonging to Denmark. In 1206, King Valdemar II of Denmark built a fortress on the island but found no volunteers to man it. The Danes burned it themselves and left. Thence they held on south to Denmark and thence east to Smálönd and had victory wherever they went. They did not come back in autumn. The next summer they held on to Rafala (Tallinn) and fell in there with sea-rovers, and fought at once, and won the fight. After that they steered east to Eysýsla (Saaremaa) and lay there somewhile under a ness. There they saw a man coming down from the ness above them; Gunnar went on shore to meet the man, and they had a talk. Gunnar asked him his name, and he said it was Tófi. Gunnar asked again what he wanted. "Thee I want to see," says the man. "Two warships lie on the other side under the ness, and I will tell thee who command them: two brothers are the captains—one's name is Hallgrímur, and the other's Kolskeggur. I know them to be mighty men of war; and I know too that they have such good weapons that the like are not to be had. Hallgrímur has an atgeir which he had made by seething-spells; and this is what the spells say, that no weapon shall give him his death-blow save that atgeir. That thing follows it too that it is known at once when a man is to be slain with that atgeir, for something sings in it so loudly that it may be heard a long way off—such a strong nature has that atgeir in it. The Chronicle of Henry of Livonia describes a fleet of sixteen ships and five hundred "Estonian pirates" ravaging the area that is now southern Sweden, then belonging to Denmark. In the XIVth book of Gesta Danorum, Saxo Grammaticus describes a battle on Öland in 1170 in which the Danish king Valdemar I mobilised his entire fleet to curb the incursions of Couronian and Estonian pirates. Perhaps the most renowned raid by the inhabitants of Estonia occurred in 1187, with the attack on the Swedish town of Sigtuna (other candidates as raiders are Karelians and Curonians). Among the casualties of this raid was the Swedish archbishop Johannes. Archaeological excavations have not verified the traditions of destruction of the town. Normal life in Sigtuna continued until town started to slowly lose its importance during 13th century due to navigability problems caused by post-glacial rebound. In 1227, Saaremaa was conquered by the Livonian Brothers of the Sword during the Livonian Crusade but remained a hotbed of Estonian resistance. The crusaders founded the Bishopric of Ösel-Wiek there. When the Order was defeated by the Lithuanian army in the Battle of Saule in 1236, the Saaremaa islanders rebelled. The conflict was ended by a treaty that was signed by the Osilians and the Master of the Order. In the following year, the Sword-Brothers were absorbed into the Teutonic Order. As the crusaders' hold on Saaremaa got stronger, Christianity also became more established on the island, and to this day Saaremaa has a unique set of medieval churches in Kaarma, Karja, Kihelkonna, Muhu, Pöide, Püha and Valjala churches. The crusader's fortress Kuressaare Castle, known in German as Schloss Arensburg, was built by the Teutonic Order, beginning in 1380, for the bishops of Ösel-Wieck (Estonian: Saare-Lääne). It is one of the most well-preserved medieval castles in Estonia and bears testimony to the late Medieval Age. During the 14th–16th centuries, and possibly earlier, local inhabitants started to expand across the Baltic Sea into surrounding areas thus establishing villages at Livonian coast. Most of Saaremaa was ruled directly by the Bishopric of Ösel-Wiek, while some parts were enfeoffed to the Livonian Order. In 1559, the bishopric and Saaremaa were sold to Denmark, becoming part of Danish Estonia. From 1570 until 1645 the entire island was under Danish possession. In 1645, Saaremaa was ceded from Denmark to Sweden by the Treaty of Brömsebro. In 1721, along with the rest of Livonia, Saaremaa (then known by its Swedish name of Ösel) was ceded to the Russian Empire by the Treaty of Nystad, becoming a part of the Governorate of Livonia. In 1840 the first spa opened in Kuressaare (then known as Arensburg), and the town experienced renaissance and became a resort for Russians and Baltic Germans. In World War I, the Estonian islands were conquered by Imperial German Army in October 1917 and remained occupied (Operation Albion) until the end of hostilities. Estonia became independent after the October Revolution and the collapse of the Russian Empire. As a result of the Molotov–Ribbentrop Pact, the new state was incorporated into the Soviet Union in June 1940 as the Estonian Soviet Socialist Republic. Most of the Baltic German population of the island was evacuated to Germany following the Pact. The island was occupied by Nazi Germany in 1941 (Operation Beowulf); German troops remained there until expelled by the Red Army in the Moonzund Landing Operation in October and November 1944. In 1946, Saaremaa was declared a restricted zone, closed to foreigners and to most mainland Estonians. It remained a restricted area until 1989. Estonia gained independence on August 20, 1991, during the dissolution of the Soviet Union. The island forms the main barrier between the Gulf of Riga and the Baltic Sea. To the south of it is the main passage out of the gulf, the Irbe Strait, next to Sõrve Peninsula, the southernmost portion of the island. In Medieval times islanders crossed the strait to form fishing villages on the Livonian coast, notably Pitrags. In those days it was easier and quicker to cross the strait towards nearby Kolka, Saunags or Mazirbe, than travel by horse large distances inland. The highest point on the island is 54 m above sea level. 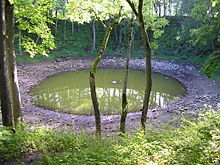 One feature found on the island is the Kaali crater. The island has lots of forested terrain. One of the symbols of the island is the juniper. More than 10,000 years ago the first parts of Saaremaa arose from the Baltic Ice Lake. The uplift of the Earth's crust is continuing even today, at 2 millimetres (0.079 in) per year. The West Estonian islands are lowlying plains resting on limestone, their average elevation being about 15 metres (49 ft) above sea level. Limestone has become denuded in a great number of places, resulting in cliffs, limestone pits and quarries at Mustjala, Ninase, Pulli, Üügu and Kaugatuma. Because of its mild maritime climate and a variety of soils, Saaremaa has a rich flora, illustrated by the fact that 80% of the plant species found in Estonia are represented here. Altogether 1200 species of vascular plants can be found in Saaremaa. About 120 of the local plant species are rare ones that have received special protection status. The most famous endemic species is Rhinanthus osiliensis, a rare little flower growing mostly in spring fens. Rare and beautiful flowers are widespread; out of the 36 species found in Estonia, 35 of them are found on Saaremaa and neighbouring islands. Over 40% of Saaremaa is covered with forests. They are mostly mixed forests but in some areas one can find broad-leaved (deciduous) trees, which are relict plant communities of former milder climatic periods. Wooded meadows were common in Saaremaa before World War II, but many of these unique natural complexes have gradually become overgrown and thus turned into the ordinary forest. The same is true for alvars (limestone areas covered with thin soil and stunted vegetation). Once a typical and exclusive landscape element in Saaremaa alvars are now in decline. Nature conservation planning for Saaremaa now includes protection of the largest and most unusual alvar areas. Saaremaa has a wide variety of rare wildlife species, ranging from insects to seals. The smallest protected wildlife species include Cloude Apolle butterflies and Roman snails. The coastal areas of Saaremaa are famous seal habitats. The gray seal that is common here can be found in three large permanent resting areas on the islets off the coast in the western and southern parts of Saaremaa. The local population of grey seals is slightly increasing. Ringed seals can be encountered everywhere in the coastal waters of Saaremaa but, because of their timidity, it has not been possible to make an estimation of their number. The islands lie in the East Atlantic Flyway, a migration path of waterfowl. This "bird road" connects northeastern Europe with Arctic regions. Each year hundreds of thousands of migratory birds visit Saaremaa in spring and autumn. The barnacle goose, mute swan, whooper swan, eider, shelduck and a great many other bird species have been given protection status. But on the whole, the islands are somewhat poorer in wildlife species than the mainland. Neither mole, mink, nor otter can be found here, the lynx and the brown bear are infrequent guests. Kaali is a small group of nine unique meteorite craters on Saaremaa. The largest of the craters measures 110 metres (360 ft) in diameter and contains a small lake, known as Kaali järv ("Lake Kaali"). The meteor cluster had an impact velocity of 10–20 kilometres per second (6–12 mi/s) and a mass of 20–80 tons. At the altitude of 5–10 kilometres (3–6 mi) the meteor broke into pieces. The largest fragment produced the main crater with a depth of 22 metres (72 ft). Eight smaller craters with diameters ranging from 12 to 40 metres (39 to 131 ft) and depths varying from 1 to 4 metres (3 to 13 ft) are all within 1 kilometre (0.62 mi) of the main crater. The age estimates of the crater vary, with 4000 ± 1000 BCE being a commonly accepted estimate, though other estimates suggest the explosion was as recent as 660 ± 85 BCE. The energy of the impact — about 80 TJ (20 kilotons of TNT), comparable with the Hiroshima bomb) — burned forests within a radius of 6 kilometres (3.7 mi). There are numerous legends related to the crater; these are summarized by Lennart Meri in his book Hõbevalge. Dolomite, limestone, curative mud, mineral water, ceramic clay, sand, and gravel are the major local resources. Of these local resources, dolomite is perhaps the most famous above all. Mihkli Farm Museum in Viki village. The majority of the population is Estonian (97%). The biggest minority nationality is Russian, comprising 2% of the inhabitants. Compared to the Republic of Estonia on the whole, the population of Saare County and particularly of Kuressaare town is younger, whereas the number of the retired people is considerably smaller. Saaremaa is located in the centre of the Baltic region with the most rapidly growing market in Europe, containing 70 million consumers. Gates to the West include not only the newly reconstructed Kuressaare Airport and Roomassaare Port, the operation of modern ferries between Saaremaa and the mainland but also the rapid development of the telecommunications, highly important for the island. Saaremaa is a tourist destination, revisited by 35% of foreign and 95% of domestic tourists. Saaremaa has an entrepreneur-friendly, safe, and strain-free economic environment. Saaremaa is reached by TS Laevad's ferries from Virtsu on the Estonian mainland to Kuivastu on Muhu island, which is itself connected to Saaremaa by a causeway, the Väinatamm. Saaremaa can also be reached by ferry from Sõru on the island of Hiiumaa to Triigi. There are also passenger services from Roomassaare to the smaller island of Abruka. During many winters it is possible to drive to Saaremaa by an ice road between the mainland and Muhu or between Saaremaa and the island of Hiiumaa. There are regular bus services from Tallinn, Pärnu and Tartu on the mainland, which use the ferry from Virtsu to Muhu. There is an airport at Kuressaare with regular flights to Tallinn operated by Transaviabaltika. In the summer season there are regular service to Ruhnu and Pärnu operated by Luftverkehr Friesland Harle, and a twice weekly service to Stockholm operated by Estonian Air. Historically there was a Soviet air base at Aste during the Cold War. Plans to connect Saaremaa to the mainland either by the Saaremaa Bridge or Saaremaa Tunnel are being studied. FC Kuressaare competes in the first tier of Estonian football, the Meistriliiga. Saaremaa competes in the biannual Island Games. Saaremaa Rally takes place every year in October and attracts thousands of rally fans. The first rally was an amateur competition and it took place in 1974. The first professional competition took place in 1975 and from 1993 the rally has been international. Saaremaa Velotuur is a group race of road cyclists that is oldest in the Nordic countries (held since 1957) and the only international one in the Baltic states. Saaremaa 3-day running marathon takes place on the roads around Kuressaare town and Sõrve peninsula. Main race consist of three different runs, which are held on three sequential days (10+16,195+16=42,195 km). The first marathon was held in 1974. Hannibal Sehested (1609–1666), Danish diplomat. Fabian Gottlieb von Bellingshausen (1778–1852), leader of the second expedition to successfully cross the Antarctic Circle and probably the first navigator to see the continent of Antarctica. Louis Isadore Kahn (1901–1974), one of the most influential architects of mid-20th century. Paul F. Saagpakk (1910-1996), author of the largest Estonian-English dictionary (published in 1982). Ott Tänak, rally driver currently competing for Toyota Gazoo Racing at the World Rally Championship. Saaremaa has more spas than anywhere else in Estonia. ^ Rand McNally and Company's Enlarged Business Atlas and Shippers Guide. Rand McNally and Company. 1893. ^ a b Toomse, Liine. "10 Estonian Islands You Should Visit." http://www.traveller.ee/blog/tallinn/10-estonian-islands-you-should-visit. Retrieved 8 March 2016. ^ a b Veski, Siim; Heinsalu, Atko; Kirsimäe, Kalle; Poska, Anneli; Saarse, Leili (2001). "Ecological catastrophe in connection with the impact of the Kaali meteorite about 800–400 B.C. on the island of Saaremaa, Estonia" (PDF). Meteoritics & Planetary Science. 36 (3): 1367–1375. doi:10.1111/j.1945-5100.2001.tb01830.x. This page is based on the Wikipedia article Saaremaa; it is used under the Creative Commons Attribution-ShareAlike 3.0 Unported License (CC-BY-SA). You may redistribute it, verbatim or modified, providing that you comply with the terms of the CC-BY-SA.